The portions here are extremely generous. A small is enough to feed two people – I shared the Hazel salad with another and the portions worked out just about right. The salad was indeed quite fresh and flavorful: the caramelized pears gave it a hint of sweetness, the hazelnuts some crunch and the gorgonzola a kick of crumbly salty goodness. Taking advantage of the family size deal value, we ordered the wood-fired Pizza Rapini and the Spaghetti Pollo e Rucola. The pizza was served on a huge platter, thankfully pre-cut. 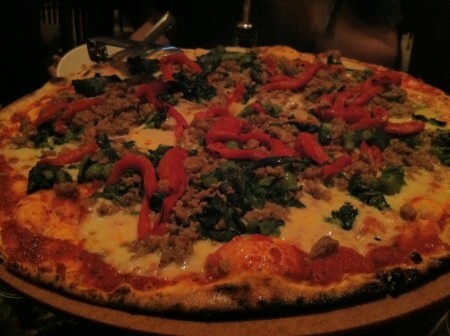 Topped with rapini, crumbled sausage, roasted red peppers and provolone, each slice was chock full of tasty ingredients . The pasta came in a large bowl, full of grilled chicken, baby arugula, semi-dried cherry tomatoes and roasted garlic. Not bad at all! We actually had trouble finishing this dish so we ended up taking what was left to go. With the establishment of Mozza, West Islanders now have a new and exciting Italian option for dinner. For something a little more traditional, check out La Serenata. Tags: Bar, Caramelized Pear, Chicken, Dinner, Enoteca Mozza, Family, Gorgonzola, Italian, Pizza, Rapini, Salad, Soup, Spaghetti.